Looking for a new go-to weeknight pasta dish? 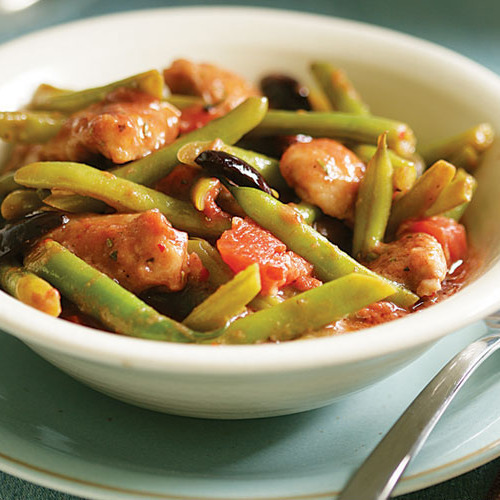 This one is super simple and has intense, warming flavors. Don’t worry if you’re not a fan of spicy foods—just use less crushed red pepper flakes than called for. Meanwhile, in a large saucepan over medium-high heat, heat the garlic and red pepper flakes in the oil until they’re fragrant and sizzle steadily for about 30 seconds. Add the tomatoes and their juices and the vodka, and bring to a boil. Then reduce the heat to a steady simmer, cover with the lid slightly ajar, and cook to intensify the flavors and reduce the sauce slightly (by about one-quarter), 10 to 15 min. Purée the tomatoes using a hand blender or a regular blender. If you used a regular blender to purée, return the sauce to the saucepan. Stir in 1/4 cup of the Parmigiano, the parsley, cream, salt and pepper, and more red pepper flakes if you like. Simmer to incorporate the cream and reduce the sauce slightly, about 5 min. Reduce the heat to low, cover, and keep warm. Meanwhile, cook the pasta, stirring occasionally, until it’s just tender to the tooth, 10 to 12 min. Drain well and return the pasta to its pot. Add the sauce, set the pot over medium heat, and cook, stirring, to let the pasta absorb some of the sauce, 1 min. Serve immediately with a sprinkled with the remaining 1/4 cup Parmigiano. Serve with garlic bread and a simple green salad. Great recipe, easy and delicious. Everyone has their own preference for heat, but I'm wondering if the widely conflicting comments (way too spicy, not spicy enough) might have something to do with how long those red pepper flakes have been in the cupboard. Great recipe for a weeknight. However, I agree with others that it was too spicy and reduced the amount of red pepper in future preparations. Also thought there was too much sauce drowning the pasta. I found using half the amount of tomatoes resulted in plenty of sauce to dress a full pound of rigatoni. It is a flavorful, quick, and easy recipe I rely on again and again. 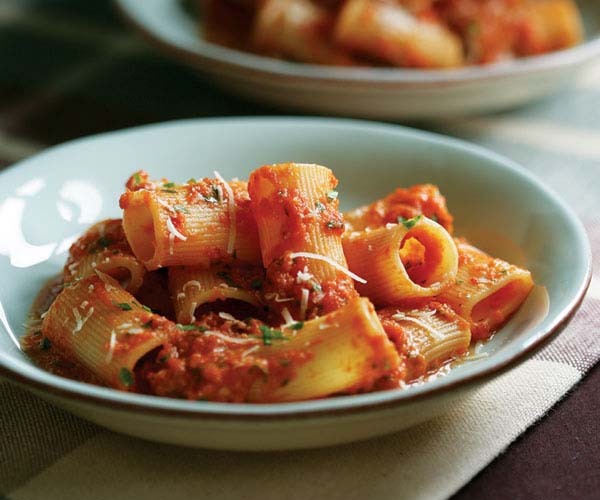 Delicious, easy pasta sauce. I am a novice cook, and had no problem making this.I made this with heavy whipping cream instead of heavy cream (that's all the grocery store had) and it turned out very well.A lot of reviewers warned about the spiciness/heat. I found that a little over 3/4 tsp. red pepper flakes was perfect for me-- not too spicy at all. I added 3/4 red pepper flakes at first, then added some more at the end when I found it could be a little hotter.I also used closer to 1 lb. rigatoni instead of 3/4 lb, and I found that there was enough sauce for the extra pasta. I LOVE spicy foods, but after reading the reviews, I cut back on the spice by 1/4 tsp I am glad that I did! It is plenty spicy. I would make this again.